This is just a reminder that today, Wednesday July 5th is a CSA share pick-up. Your share will be ready for you to pick up at your chosen pick-up location between 4-7 pm. We are excited about this week's harvest. We are looking forward to seeing you on the farm! An old farm adage declares, "knee high by the Fourth of July." Of course, it refers the the minimum height a corn crop should be by Independence Day but, we've adopted the saying ourselves as the fields are overflowing with summer produce that is tall enough to brush our knees while we work. As if inspired by the festivities of this month's holiday, the beets were as brilliant and breathtaking as the fireworks seen in the night sky. 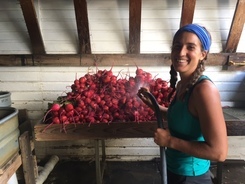 Besides their prismatic deep red, pinwheel white and pink, and sunset orange colors, are the incredible size of the beets! Honestly, I'm convinced, by evidence of the head lettuce and now beets, that the interns are whispering "bigger is better" to all of the seeds as they are buried into the ground. Whatever size magic is at work, we couldn't be more thrilled. If the beets are fireworks, then our flag would be the salanova. Tidy lines of green and red plants distinguish the field with a farm version of the great stars and stripes banner, only ours doesn't get hoisted up a flag pole and bonus, it is edible! If the sight of the orderly crops wasn't enough, the salanova is being harvested for the most tender and delicious salad mix! What holiday is complete without a feast? Well this week we've harvested a feast of beans and peas and now, as with any good holiday host, our refrigerator (aka walk-in cooler) is stuffed full of thousand of pounds of our offering. Favas and English shelling peas are still on our menu this week and continue to provide a sweetness only summer can promise. Not only does Fourth of July inspire the field with it's own version of holiday festivities, but it is also an important time keeper at the farm. July is the deadline to plant the last of the crops if they are expected to produce by late summer. This week we've done our final plantings of cucumbers, summer squash, and even found time to get the dried beans in the ground for fall! Certainly, the most important aspect of a holiday is the message that the reason for celebrating imbues. If independence is the theme for this month then here at the farm we are aiming to achieve. The tiny chicks that came to the farm in October are now fully capable egg layers and will be stellar contributors to our egg share! 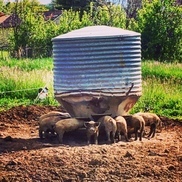 Our breeding mother pigs were busy during spring taking care of babies, and now we have a piglet playground of 28 little ones that are weened and enjoying independence wallowing in mud and playing with one another. The interns are even gaining a freedom of their own because we have a full team that can now drive manual transmission! Oh the places we will go! As always we are grateful for the role we get to play in this country as a small farm bringing good food to our small community! 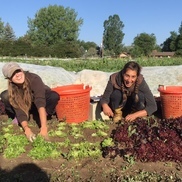 Local food invokes an idea of independence in its own right, and we are just happy to keep farming for you all as long as you are excited to keep eating what we grow! Boil 2 fennel bulbs, trimmed and split lengthwise, until tender, about 15 minutes. Place fennel, cut side up, in a buttered 8-inch square baking dish and brush with 1 tablespoon softened butter. Season with coarse salt and ground pepper and top with 1/3 cup grated Parmesan and 4 sprigs thyme. Bake until cheese is golden brown, about 20 minutes. Make like the French and serve with crusty bread and baked eggs for breakfast, or roasted chicken or fish for dinner, bon appetit! Preheat oven to 425°. Arrange bacon in a single layer on a wire rack in a jelly-roll pan; bake 20 minutes. Turn bacon; bake 5 more minutes or until crisp. Cool 5 minutes; chop. Reserve 3 Tbsp. plus 2 tsp. drippings. Stir together peas, next 4 ingredients, 1/2 tsp. salt, and 2 tsp. bacon drippings in a medium saucepan. Bring to a boil over medium-high heat. Reduce heat to medium, and simmer, stirring occasionally, 20 minutes or until peas are tender. Drain peas, and discard garlic and thyme. Sauté onion in remaining 3 Tbsp. hot drippings in a large skillet over medium heat 1 minute. Stir in vinegar, next 2 ingredients, and remaining 1 tsp. salt, and cook, stirring constantly, 30 seconds or until smooth and slightly thickened. Gradually add oil, stirring constantly. Stir in pea mixture, and cook 1 minute or until thoroughly heated. Toss together parsley and kale in a large bowl. Top with peppers and warm pea mixture. Sprinkle with chopped bacon and parsley, and serve immediately. Cook the fava beans in boiling water until just tender. Drain and set aside. Head the oil in a pan over medium heat and add the tomatoes and garlic. Cook until tomatoes begin to color. Add the feta, parsley, olives and lemon juice (to taste) to pan. Mix in fava beans. Cook for a few minutes on low heat, with a lid on, until warm and melty. Add salt and pepper to taste. Garnish with dill. -Thanks Kirsten for sharing your fava recipe! Coming next week... salad mix, beets, garlic, fava beans, and more. Egg share - please pick-up this evening! Bread share - production snafu fixed- pick up this week! The pods of these sweet crisp peas are bright green, swollen, and heavy right off the vine which means they are begging to be eaten right now! Unlike sugar snap peas or snow peas, the fibrous pods of English peas cannot be eaten (although they can be used to enhance the flavor of vegetable stock). Shell English peas immediately before they're to be cooked: Break off the stem and pull the fibrous string down the length of the pod. Press each pod between your thumbs and forefingers to open, pushing out the individual peas. Rinse and drain the peas, discarding pods, stems, and strings.For the easiest preparation, boil peas in 1/4 inch of simmering, generously salted water for two to four minutes until tender. Drain and serve with a large pat of butter. Use them in a sweet pea soup. Pair peas with beer-braised sausages and pine nuts for a fast and easy Spring feast. Dress them up the Michelle Obama way: with leek, shallot, and lemon for a light and bright salad. Take a cue from the garden with a cheesy pasta dish that not only includes peas but also asparagus, Spring onions, and butter lettuce. Make a delicious pasta salad. Add variety to a springtime salad by tossing in a handful of blanched-then-shocked peas. Remove the thick skin on each individual bean by squeezing them with your fingers to break the skin and push the bean out. Mix salt, chile pepper, rosemary, garlic, olive oil and water together in a large bowl. Toss to coat the fava pods, then place them on the grill over medium-high heat. Remove pods from grill, return them to the mixing bowl, and squeeze the lemon over them. Toss the pods to coat. Check the seasoning, and add salt if necessary. Snip the ends of each fava bean pod to create an escape for the steam that will build up inside the pods during cooking. Heat a large cast iron skillet over high heat. Once the skillet gets very hot, bottom with ghee . Place the fava bean pods into the skillet in as close to a single layer as possible. Let the pods cook until lightly charred on one side, be careful not to let them burn however. Turn the pods and cook them on the other side. Add the mint leaves at this point, letting them come into conatact with the skillet wherever possible until lightly charred. Watch the fava bean pods carefully as the char, they will begin to inflate from the steam inside. As soon as they begin to deflate and become a bit limp, shake the skillet and remove it from the heat; season liberally with smoked sea salt. Serve either straight from the skillet or transfer them to a warm platter, drizzling them with a bit of olive oil. Encourage people to eat the fava beans straight from the pods with their hands edamame style. Leftovers are great cold the next day as well! - Thanks for sharing this technique Claire!